1 of 4 Place peppers in a 5-quart slow cooker. Season pork with salt and pepper. Place in slow cooker on top of peppers, fat side up. 2 of 4 In a medium bowl, stir together sweet and tangy sauce, pineapple and chili sauce. 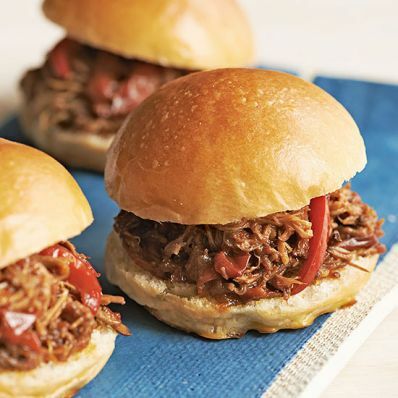 Pour Simply satisfying slow cooker ideas from Sandra Lee over pork. Cover and cook on LOW for 8 to 9 hours. 3 of 4 Remove pork and let rest 5 to 10 minutes. Strain and de-fat cooking liquid. When cool enough to handle, pull or chop pork. 4 of 4 To serve, top buns with peppers, pork and sauce.